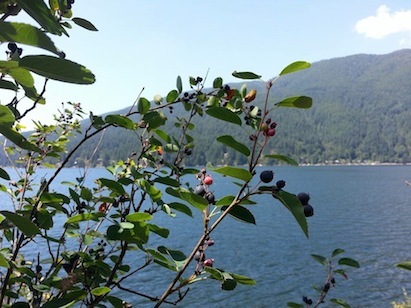 Paddle the cool waters of Indian Arm amidst the gentle tides, the mountain views and the running breeze. Vancouver serves to make all these happen, right here right now in our backyard. In Vancouver, kayaking is among the staple of leisurely activities west coast has to offer, thanks to our temperate climate, rich eco-diversity, active lifestyle and global tourism, we get to nurture our mind, body and spirit all in one day. Combing through Mount Seymour, be prepared to truly savour peace and tranquility amidst the woods through to the Indian Arm. Largely pristine and respected, the path narrowly leads to the inlet where the paddling begins. After gazing through recreational properties on the woods, mostly highlighted by sun roofs, numerous decks serve as the gateway through the calm inlet. An astounding heap of wood turned into kayak will take you to the first of the inter-island scenic pit stops. The usual calm waters regularly flicker with bio-luminescent tiny jelly fish with its mostly orange hue. Occasionally, the larger stinging variety may appear so make sure you gear away from it as soon as the orange floating mass is in sight. The islands along the side cradle seals big and small which can be regularly viewed popping in and out of the water, they provide entertainment on their own. There are numerous sea stars (usually purple) that make for a regular meal in this water -to- land-to- air food chain. Don’t be surprised to see Majestic Bald Eagles hover into the sky on the lookout for Salmon (what an awesome sight during their Summer to Fall run). The heat and constant motion makes for a great appetite. For after constant waves and hellos to regular residents, the scent and aroma off their sun-drenched kitchen will get you thinking of your own sustenance. What would make it authentically west coast other than grilled Salmon over home- made potato salad or maybe corn on the cob and a cup full of creamed berries altogether. Ooh, can’t go wrong with creamed berries any time eh! After a short barbecue set up, you get to enjoy the picnic lunch while sitting comfortably atop mid island rocks and feast thy senses to a spectacular panoramic view of the mountains. Lo and behold! There altogether, your mind, body and spirit is nurtured at the perfect moment by all the elements. Couldn`t ask for more on any given day I must say! Blissfully, the paddle now becomes your most important companion on the way back as you come face to face amidst the strong but stable reverse current. As the sun leads the show of strength, you come to terms in realizing that rekindling with nature on the reverse current is just as empowering as being led by its senile tranquility. Instead of being adrift with its might, you embrace the fruit of opposing elements coming together to render harmony. After all this journey is about life as we live it, as we hear it and as we know it until nature undeniably tells it like it is, west coast style of course. But then again it`s just me. Vancouver couldn’t be all that dreamy is it?